I am just starting to explore the capabilities of my electronics (new N2K network, B&G Zeus plotters, Maretron weather station, etc.). I am loving the weather display screen on the Maretron DSM-250 at my nav table, which gives ground wind speed and direction and a bunch of other useful information. I am also loving the 10-minute wind graph on the Zeus plotter which is so extremely useful for sailing -- you see the pattern of gusts and wind shifts exactly, you see trends developing. Now the only thing I'm missing is a longer-term graph of wind speed and direction. It's a shame that Maretron didn't see fit to include something like this in the expensive DSM-250, nor can it be programmed in. There is a 24-graph of barometric pressure; surely wouldn't have been hard to have the same thing for wind speed & direction. I guess I'm going to need to implement this on my PC. I do get all the network data onto my boat PC via an Actisense N2K-to-USB bridge. Has anyone implemented anything like this? Any hints? P.S. -- one big disadvantage of all this is that the network has to be powered up 24/7 to get weather data. It doesn't use all that much power, but I can imagine situations where I might not be keen to leave it running. I'm glad that at least I have a stand-alone barograph. I am glad that at least I configured the system as two separate N2K networks, joined by the Maretron bridge. That way, I can at least power down everything in the cockpit, even while the nav table instruments and all sensors are running. Brilliant!! Yes, I did somehow miss that. How did you do it, exactly? Got it! Very cool! I've been so busy installing all this stuff I haven't really had a chance to play with it. So I have a 24-hour line graph for ground wind speed on half the screen, and instantaneous ground wind direction on the other half. No line graph available for direction, unfortunately, but this is already good! Now, what about wind direction history? NO instrument has it? The B&G Zeus plotter does it, but only for 10 minutes. That's just what you need for tactics (the purpose of this function), but not to analyze the weather -- see whether the wind is backing or veering. I would like to have that but it looks like PC implementation only, unless I can find a hidden function in the Zeus plotter which allows changing the time horizon of the wind graph. The Tritons display 10, 30 and 60 minutes of graph data (user selectable). In addition, they keep track of the low, average and high values. The Zeus probably does also. Not exactly what you want, but great information and display when sailing. 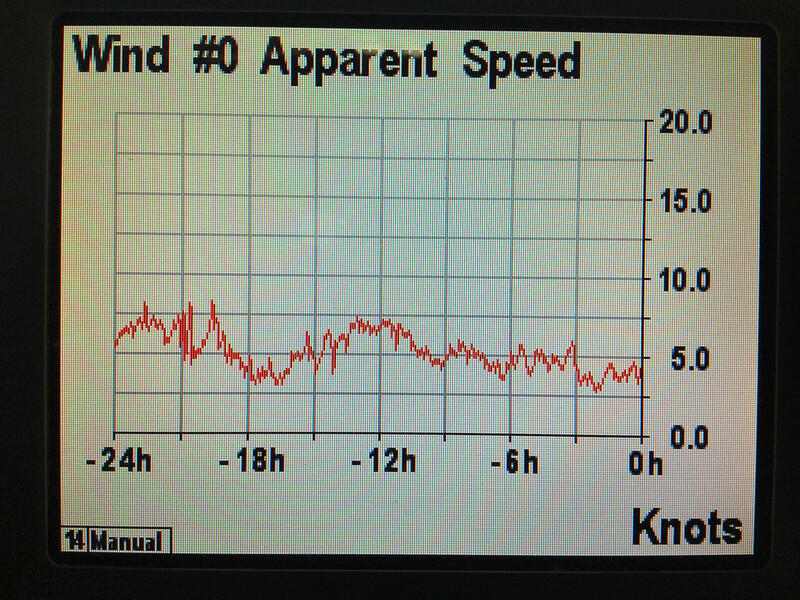 Edit: The Tritons also display a graph of wind direction simultaneously with wind speed for the above time choices. I have figured out how to set up a wind speed histogram and how to choose between 10, 30, and 60 minutes' horizons. But for the life of me, I can't figure out how to "display a graph of wind direction simultaneously with wind speed for the above time choices". Or to show low, average, or high values. Can't find anything in the manual. Any hints? Do you have the most recent firmware in it? B&G are putting in new functionalities like crazy - firmware is coming out frequently. The speed/direction graph is now one of the standard pages. However, the times are now 10, 20, 30 minutes instead of 10,30 and 60. They were very late getting the Tritons released, and I think they put them out without much of the functionality that was planned. Ours were some of the very first units and they came with pre-release software versions. B&G is certainly making up for it now. Also download the new version of the manual - it has the latest changes and updates. Clearly I don't have the latest either firmware or manual. I will download all of it. Your screenshot looks just like the Zeus wind plot. For the life of me, I can't figure out how to change the time horizon of the Zeus plot. But I am pretty pleased with the simple wind histogram you inspired me to find in the Triton. It's blowing 38kts? Is that normal where you are? The Triton firmware is easily upgradeable from your Zeus - just download it from their website. The new wind graph page looks like that on the Zeus. I don't know how to adjust the time on the Zeus. On the Triton, it is the up/down keys. If you select the wind graph window on the Zeus, is there a similar up/down key? If B&G ever includes an AIS radar plot on the Triton, it will be game over for the others. Yes, completely normal. It's the English Channel, after all And that's in shelter, miles up the Hamble River, on my mooring. It's been blowing in the 40's out in the Channel today. It was like that every day during April and May last year, without a break. When I first arrived here, in similar conditions, and asked another sailor how long the gale had been blowing, he looked at me askance -- "gale"? F8 is known disparagingly as a "yachtsman's gale" in these parts; only a F9 is truly worthy of the name. You learn to cope with it with time (and with extra reefs sewn into your sails). What's actually dangerous is the sea state you can get with the strong tidal streams here. When it's blowing in the 40's against a 4 knot current, it can be dangerous even for large commercial vessels. The entrance to the Needles Channel is a vast graveyard of ships, actually, going back centuries -- when a SW gale meets the SW-flowing ebb, the sea state can be simply unsurvivable.